An uneasy calm returned to the battleground Yemeni city of Hodeida on Thursday after further overnight skirmishes as the warring parties await the promised deployment of UN staff to oversee a hard-won but fragile truce. The ceasefire in the Red Sea port city which is a vital aid lifeline for millions at risk of starvation is the centrepiece of a peace push that is seen as the best chance yet of ending four years of devastating conflict. 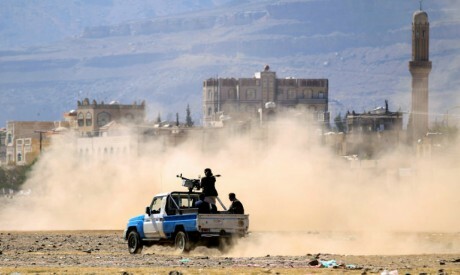 Military officials and residents have reported intermittent fighting between government forces and Houthi Shia rebels since the UN-brokered ceasefire came into effect in the Red Sea port city on Tuesday. A pro-government official told AFP that four loyalists were wounded in a firefight on Wednesday night. "The exchange of fire lasted for about half an hour, and there is an uneasy calm this morning," he said. Residents reached by telephone confirmed to AFP that there was no fighting on Thursday morning. The official added there has been intermittent fighting on a number of battlefronts in Hodeida province, including the districts of Hays and Al-Tuhayta. Pro-government forces and Houthi rebels accused each other on Thursday of breaching the ceasefire agreed at talks in Sweden earlier this month. The rebel-run Saba news agency said loyalists targeted a "number of neighbourhoods in the city" overnight. UN observers are due in Yemen to head up monitoring teams made up of government and rebel representatives tasked with overseeing the implementation of the UN-brokered ceasefire, under the auspices of a Redeployment Coordination Committee. The committee's UN chair, Patrick Cammaert, convened its first meeting by videoconference from New York on Wednesday "to discuss the general outlines of its work, including agreement of a code of conduct", UN spokesman Stephane Dujarric said. UN chief Antonio Guterres was "breathing down the neck" of officials to make sure the UN observers are deployed as soon as possible, Dujarric said. He added that Cammaert will head on Thursday to Jordan from where he will travel to the rebel-held capital Sanaa and Hodeida. A UN official told AFP that he was expected in Amman on Friday. "His departure to Yemen depends on logistics arrangements and flight availability," the official, who requested anonymity, said. Brigadier General Ahmed al-Kokbani, a Yemeni government representative on the committee, told AFP that the videoconference with Cammaert covered the bases of the committee's mission. "Cammaert asked members of the team to work diligently in calming the situation and to reject any violations," he said. The Saudi-led coalition said Wednesday that the hard-won ceasefire agreement will collapse if rebel violations persist and the United Nations does not intervene. The committee's observers are due to oversee the withdrawal of the warring parties from Hodeida, including a rebel pullout from the city's docks that are the entry point for 80 percent of Yemeni imports and nearly all UN-supervised humanitarian aid. Cammaert is due to report back to the Security Council on the situation on the ground on a weekly basis. According to the International Crisis Group, the "odds are stacked against" UN envoy Martin Griffiths and his team. "The Hodeida agreement came about in a rush, and critics have assailed it as too vague and open to interpretation," it said in a statement on Wednesday. "Griffiths will now have to build on this imperfect but highly welcome and overdue agreement, which, as Crisis Group has argued, the UN Security Council should endorse via a new resolution. "Without strong international support, the Hodeida ceasefire will falter." The war between the Shia Houthi rebels and troops loyal to President Abedrabbo Mansour Hadi escalated in 2015, when he fled into Saudi exile and the Saudi-led military coalition intervened. The conflict has pushed 14 million people to the brink of famine in what the United Nations describes as the world's worst humanitarian crisis.